Felt keychain is a relatively new key chain, the felt keychain of us is a simple and basic design, but it has a variety of colors for you to choose from. The felt keychain has good display area, we can custom print exclusive logo or letters on it for you. You just need to tell us your demands. The keychain is a good item for us, when you're late, there's nothing worse than being unable to find your keys, so select a bright color felt keychain for yourself, it will never let your keys lost track. 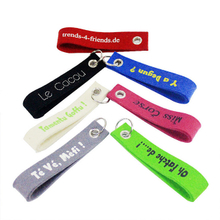 Because the customized felt keychain is cheap and fine, so you can also but them as your promotional gift. The custom felt keychain with your company logo will make your company be known by more people. It is a good way of publicity. The felt keychain can bear certain gravity, won’t easily fracture even though there are many keys hanging. For more details about the custom design of felt keychain, you can contact to us.